Raccoons are nocturnal animals and reside where wooded lots are available for nests. Because their natural predators are nonexistent in cities or metropolitan suburbs, raccoons have populated excessively. This has led to more of them carrying the rabies virus. In fact, raccoons are the most likely carrier of this virus in many states across America. Besides posing a health threat to pets and humans, they love to tear apart garbage and pilfer gardens. They love to dig in yards and have been known to uproot sod and grass in search of tasty grubs and insects. 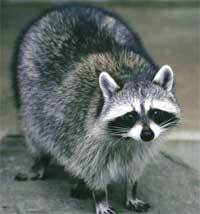 Raccoons will readily take advantage of fish and turtles kept in small ponds as well as pet birds. Many times dogs and cats are blamed for making a mess of garbage when in fact the culprit is a raccoon. If a raccoon has been active on or around your home, it is only a matter of time before they figure out how to get into your attic or crawl space.